More than 2 feet of snow buried parts of Massachusetts as the second nor’easter in six days pummeled the Bay State. As of 7 a.m., nearly 6 inches of snow had fallen in Boston, and though that’s enough to close the city’s public schools and wreak some havoc on your morning commute, the total pales in comparison to what communities farther west are experiencing. The National Weather Service reports that at 8:55 a.m., 13.6 inches of snow had fallen in Billerica; there were 16 inches in Clinton; and Adams was dealing with 26 inches of snow. Hundreds of school districts in Massachusetts are closed or delayed due to the storm, including metro-area colleges like Brandeis, Tufts, and UMass Boston. Courts across the state will open late on Thursday morning, and Gov. Charlie Baker closed the state’s non-emergency executive branch offices. Like last week’s storm, power outages have crippled several communities in Massachusetts. As of 9:32 a.m., the state Emergency Management Agency reported 352,380 customers were without power, particularly in Essex, Middlesex, and Worcester counties. 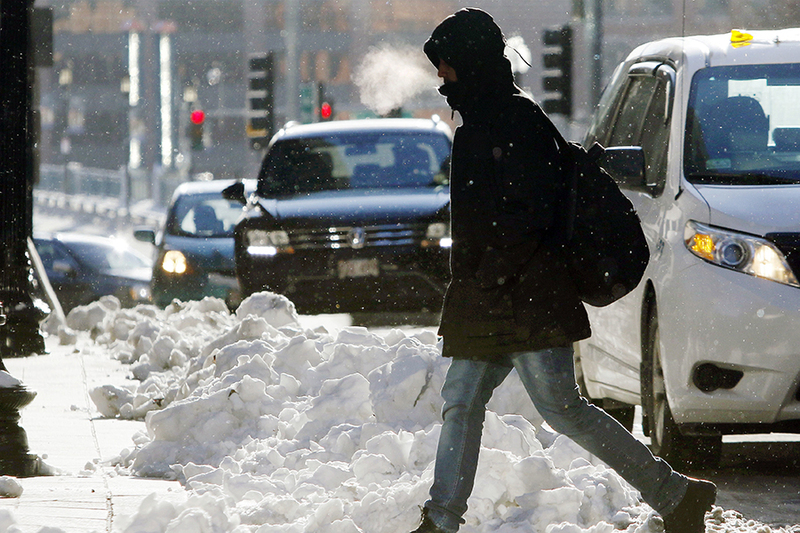 To no one’s surprise or delight, the Thursday morning commute was also impacted by the storm. The speed limit was reduced to 40 miles per hour on the Mass Pike between the New York border and Millbury until 9:30 this morning, and both MEMA and Gov. Baker asked drivers to stay off the roads if possible to make way for snow removal vehicles. The Massachusetts Department of Transportation deployed more than 3,000 crews to clear state roadways. The MBTA reported several delays on the T, and due to wire damage sustained from a downed tree, shuttles have replaced D line trains between Riverside and Reservoir. Additionally, at roughly 6:30 a.m., a commuter rail train in Wilmington “experienced a low-speed derailment,” according to a statement from Keolis. The Lowell line train was traveling inbound with just over 100 passengers, none of whom were reported injured. Though the storm packed a punch with precipitation, its winds were significantly less catastrophic than the 93 miles per hour gusts that ripped through southeastern Massachusetts last week. The greatest wind speeds were reported in Plymouth at 55 miles per hour, and a 46 mile per hour gust was recorded in Boston.